I really hope that it’s good news. But I am not hopeful. She did say that she would call if something were amiss. Guess I’m waiting to talk to her tomorrow afternoon because I can’t get away during the morning to do it. UGH, teacher’s schedule. So here’s some foods from the past couple of days. Sorry I’ve slacked off but hopefully you all will understand my being behind. Today’s eating was good: 111 grams protein, 34 grams carbs and 42 grams fat, 883 calories. 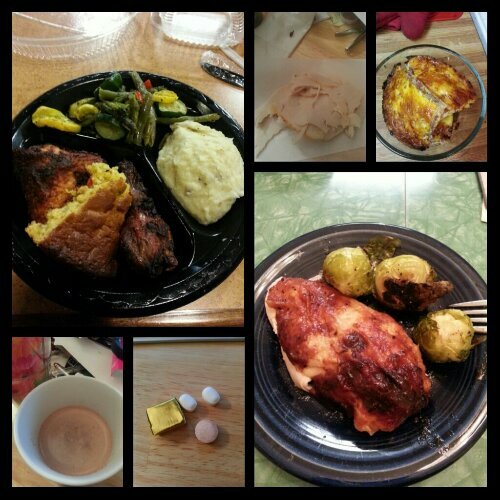 Today’s food choices, from upper right: ham, egg and cheese breakfast casserole; baked chicken, mashed potatoes, mixed veggies and little bit of cornbread; multivitamin and calcium supplements x2, iron supplement; Swiss Miss diet hot cocoa; baked barbecue chicken breast with roasted Brussels sprouts; roast turkey breast slices. Yesterday’s eating was okay. 969 calories, 82 grams protein, 52 grams carbs (I eat more carbs on the days I exercise) and 37 grams of fat. I stayed home from the gym but I did a 30 minute walking session with a fitness game I have called Walk It Out. Nice change of pace and I definitely felt muscles in my legs being used that I don’t normally use as vigorously. 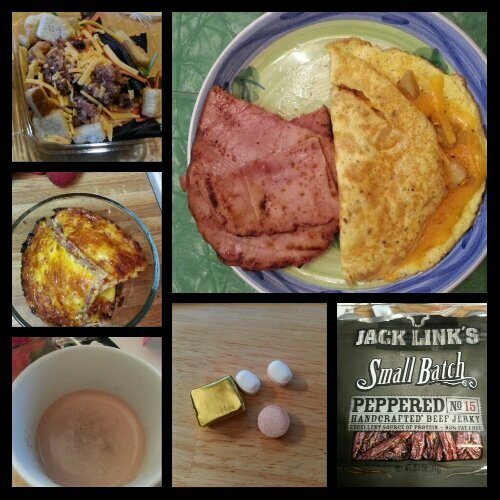 Monday’s food choices, from upper right: one-egg omelet with cheese and leftover hash browns, leftover ham; Jack Link’s peppered beef jerky; multivitamin and calcium supplements x2, iron supplement; Swiss Miss diet hot cocoa; ham, egg and cheese breakfast casserole; mixed green salad with carrots, cheese, bacon, and croutons. Not shown: leftover red beans and rice; 9 pecan halves; leftover pita half. This entry was posted in daily bites, eating, la guerra, post-op, the sleeve, vsg, weight loss surgery, what's up doc? and tagged bloodwork, daily bites, eating, la guerra, life happens, post-op eating, post-op life, side effects of WLS, sleeve gastrectomy, stress, VSG, vsg realness, what's up doc?, WLS. Bookmark the permalink. I hope everything is alright, I will be thinking about you.